for both continuous and intermittent dc loads. The chargers are constant voltage devices with automatic current limiting. Voltage regulation and current limiting are controlled by solid-state integrated circuitry to assure maximum performance in minimum space. • Electronic and electrical components are substantially derated to assure long life and reliability. Typical MTBF is100,000 hours minimum. Components are selected or designed to provide a system life expectancy in excess of 30 years. • Control circuits, alarm circuits and electrical sub-assemblies are printed circuit board wired or modularized with plug and socket connections for easy serviceability. • Control modules and many electrical sub-assemblies are standardized across the entire range of charger sizes. This minimizes spare parts inventory and simplifies maintenance. 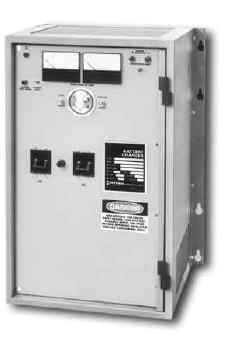 • Front panels are recessed to prevent accidental damage to meters and controls. Standard cabinets are NEMA-1 enclosures of heavy-gauge phosphatized steel with an attractive, long-lasting acrylic enamel finish. • A complete service manual, color-coded wiring, test-point identification and circuit-symbol labeling of internal components make troubleshooting easy. • Tap adjustments are not required. Output float voltage, equalize voltage, current limit and alarm levels are potentiometer adjustable. • Internal components and connections are easily accessible and/or removable through a hinged front door that opens approximately 180 degrees for easy serviceability. • Cabinets are floor, wall or rack mountable and equipped with knockouts for cable or conduit entrance. Input, output and remote alarm connections are wired to easily accessible, internal terminal blocks. • Standard transformers are available with taps for nominal voltages as listed below. GSCR-260-T-016 260V, 16A, 3 Ph. GSCR-260-T-025 260V, 25A, 3 Ph. GSCR-260-T-035 260V, 35A, 3 Ph. GSCR-260-T-050 260V, 50A, 3 Ph. GSCR-260-T-075 260V, 75A, 3 Ph. GSCR-260-T-100 260V, 100A, 3 Ph. GSCR-260-T-150 260V, 150A, 3 Ph. GSCR-260-T-200 260V, 200A, 3 Ph. GSCR-260-T-300 260V, 300A, 3 Ph. GSCR-260-T-400 260V, 400A, 3 Ph. GSCR-260-T-500 260V, 500A, 3 Ph. GSCR-260-T-600 260V, 600A, 3 Ph. Place an “F” after the part number when ordering a charger with filtering. a battery eliminator. The filtering is included. † GSCR chargers have 30 mV Filtering with 4X battery connected.